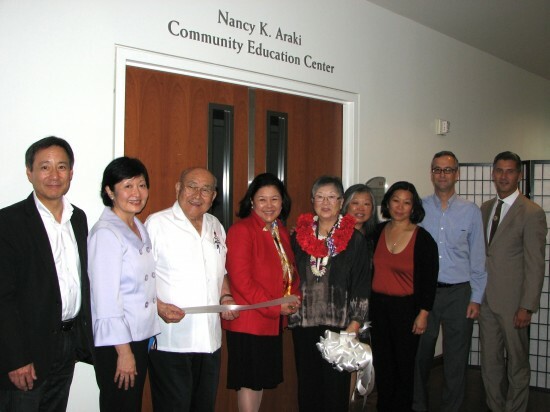 Pictured in front of the Nancy K. Araki Community Education Center are (from left) Gordon Yamate, chair of JANM’s Board of Trustees; Miyoko Oshima, former co-executive director; Bruce Kaji, founding chairman; Irene Hirano Inouye, former president/CEO; Nancy Araki, former director of community affairs, with her daughters, Lianne Araki and Kathy Araki, and son-in-law, Ed Hattyar; President/CEO Dr. Greg Kimura. 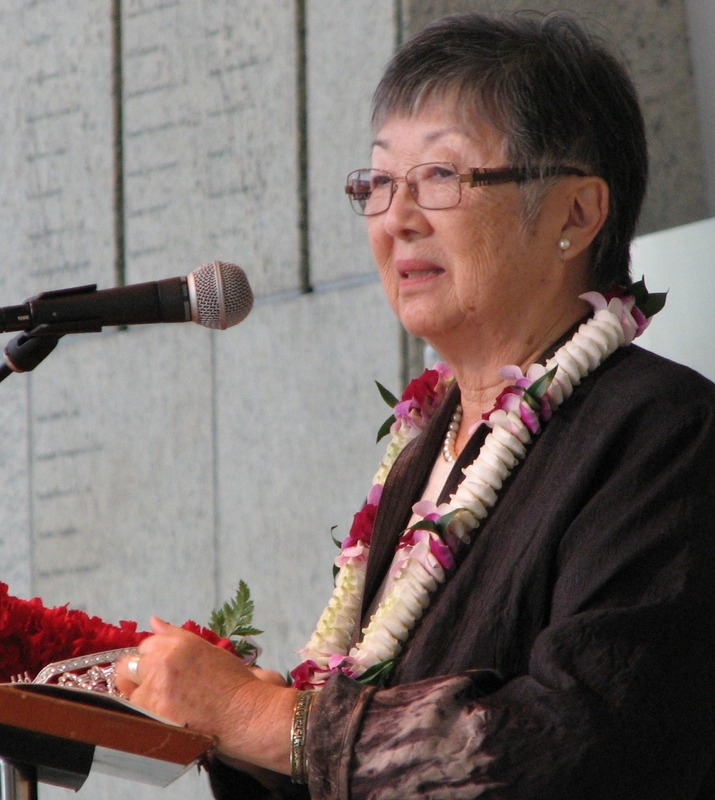 When Nancy Araki became the first employee of the Japanese American National Museum, there was no museum. There was only a small office in a refurbished warehouse at 941 E. Third Street, a few blocks from Little Tokyo. Twenty-eight years later, about 200 people, including JANM’s staff, board and volunteers, gathered at the museum’s spacious Aratani Central Hall on Sunday to wish her well on her retirement. Araki stepped down as director of community affairs on Sept. 30. 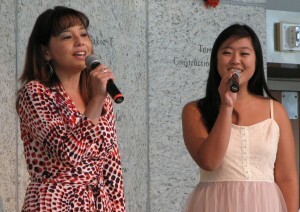 Nancy Araki gives thanks for all the accolades. He credited Araki, who was previously with Visual Communications, with putting together a film about Japanese American history that “totally impressed” then-State Sen. Art Torres and persuaded him to introduce a bill providing more than $1 million in funding for the museum. “You’ve been an important part of our lives for so many years, you’ve seen children, grandchildren come into the institution. We would not have felt that the National Museum was such a special place if you had not been a part of it,” Hirano Inouye told Araki. Among those sharing fond memories of Nancy Araki were former City Councilmember Jan Perry, Mitch Maki of JANM’s Board of Governors, and veteran and docent Hitoshi Sameshima. Miyoko Oshima, who served as interim co-executive director with Araki in 2011, recalled that staffer Clement Hanami referred to the pair as MONA (their initials), as though they were one person. Hitoshi Sameshima, representing the Nisei World War II veterans and the museum volunteers, said he asked his colleague for their impressions of Araki and got comments like “born leader … very approachable … nice personality … positive attitude … has a wealth of information.” “What this signifies or boils down to is, Nancy, they all love you. We hate to see you leave,” he said. Former City Councilmember Jan Perry, who represented Little Tokyo, remembered one of her conversations with Araki. “You said the techniques that the museum used could be shared and taught with other institutions because that is part of the mission of the museum, and what will continue its relevance in binding it together with greater institutions all over the world … Such a simple comment, but it always affected me on a very deep level because it represents to me who you are. Gordon Yamate, chair of JANM’s Board of Trustees, announced that the room formerly known as Education Center II will now be called the Nancy K. Araki Education Center. 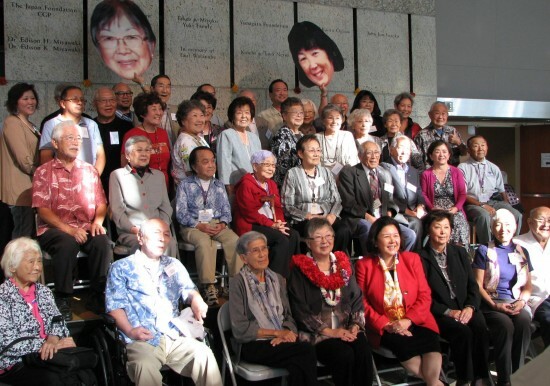 The room is used for docent training, meetings of the Little Tokyo Community Council Executive Board, and rehearsals for the Cold Tofu comedy group, among other activities, and whenever people think of that place, “they will also think of you, Nancy, and what you’ve done for this institution,” Yamate said. The event concluded with the cutting of the cake (inscribed “Nancy — Heart of Our Community”) and a group photo with JANM’s pioneers. Nancy Araki (front row with Sumi Hirasaki and Irene Hirano Inouye) is joined by staff members, volunteers and supporters who were with the museum before 1994.